The owners of a Marshfield home called me in to repaint their wood trim and pointed out wood that had rotted, including a window sill that was infested with insects and a facia board under a gutter that had a gaping hole in it, where it had rotted away. When I examined the home more thoroughly, I discovered that six more sills were rotten and the wood trim had split severely in a number of places, due to the paint wearing away. All of this wood had to be replaced. I removed some of the storm windows and gutters and carefully removed the rotten wood. I sawed off some of the wood ends by hand. Only the outside length of the rotten window sills needed replacing. I cut off the rotten parts and recut new pieces to fit. This involved making five precisely angled cuts to recreate each piece. The new pieces fit perfectly, for a seamless look and proper drainage away from the windows. 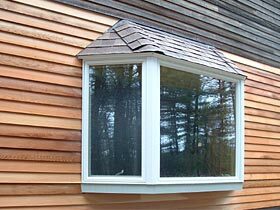 Feel free to contact me for a free consultation and a no obligation estimate on your next carpentry or remodeling job. After decades of New England seaside weather, these decorative trim boards were rotting and unsightly. The trim was hand-crafted, primed and painted to match the original trim. Animals had managed to eat away these facia boards beneath a gutter. 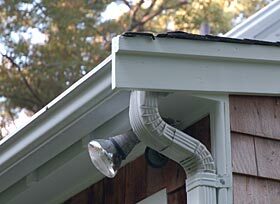 The gutter was removed, and the structure was rebuilt, primed and painted. The paint had worn away, leaving the wood exposed to the harsh New England weather. 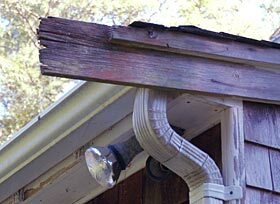 The rotten wood was removed. The remaining trim was sanded, puttied, primed and painted. 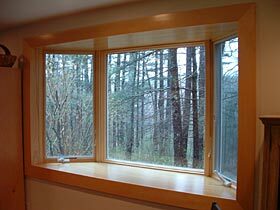 This Andersen bay window was installed and finished to reproduce the look of the original. Three coats of oil polyurethane should hold up on the inside while the outside is finished in Duration.